I have built a list with items in it and each item has its own unique expiry date. I was wondering if you can set email reminders for each item to send an email to the list owner when the item is 2 months from expiring, 1 month from expiring and 2 weeks from expiring? Please remember, each item has its own expiry date so the email would have to be unique for each item. You can manage this through using the Information Management Policy which is in the List Settings. You can trigger an action off any Date Field, even the Created or Modified Date field. If you have an 'Expiry Date' field, you can use that. When the data criteria is satisfied you can use it to trigger a custom workflow to send an email reminder. A note on the 'recurrence' - I understand this to be a bit like a 'snooze' on an alarm clock. If you configure your reminder to be triggered 1 month before the Expiry Date, then set the 'snooze' to two weeks, I think this would satisfy your requirements. Here is an Answer I posted to a similar question yesterday - please check out the SP Maven's blog post on this subject. You can also achieve all of this through using Windows Task Scheduler to run a powershell script, which in turn will start a Sharepoint Designer workflow. This needs to be configured on the server. I would try out my first suggestion though. Updated - sorry I just realised you're using SP Online, I think the latter option won't be possible for you. 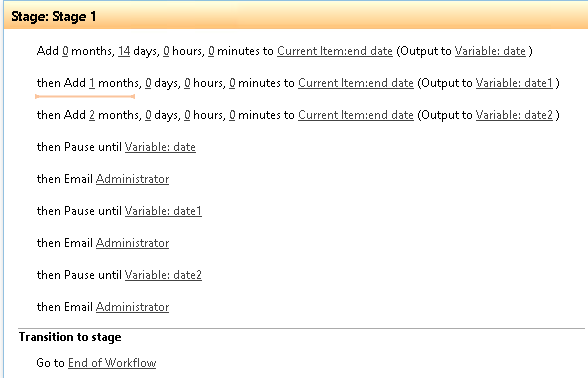 There is another method which use workflow “Add Time to Date” , “Pause until date” and “send an email” actions. You can select to start the workflow automatically when an item is created in the workflow settings. Not the answer you're looking for? Browse other questions tagged sharepoint-online sharepoint-list sharepoint-email information-lifecycle-management or ask your own question.